William Thomson, 1st Baron Kelvin OM GCVO PC FRS FRSE (/ˈkɛlvɪn/; 26 June 1824 – 17 December 1907) was a Scotch-Irish mathematical physicist and engineer who was born in Belfast in 1824. 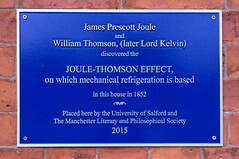 At the University of Glasgow he did important work in the mathematical analysis of electricity and formulation of the first and second laws of thermodynamics, and did much to unify the emerging discipline of physics in its modern form. He worked closely with mathematics professor Hugh Blackburn in his work. He also had a career as an electric telegraph engineer and inventor, which propelled him into the public eye and ensured his wealth, fame and honour. For his work on the transatlantic telegraph project he was knighted by Queen Victoria, becoming Sir William Thomson. He had extensive maritime interests and was most noted for his work on the mariner's compass, which had previously been limited in reliability. Absolute temperatures are stated in units of kelvin in his honour. While the existence of a lower limit to temperature (absolute zero) was known prior to his work, Lord Kelvin is widely known for determining its correct value as approximately −273.15 degree Celsius or −459.67 degree Fahrenheit. He was ennobled in 1892 in recognition of his achievements in thermodynamics, and of his opposition to Irish Home Rule, becoming Baron Kelvin, of Largs in the County of Ayr. He was the first British scientist to be elevated to the House of Lords. The title refers to the River Kelvin, which flows close by his laboratory at the University of Glasgow. His home was the imposing red sandstone mansion Netherhall, in Largs. Despite offers of elevated posts from several world-renowned universities Lord Kelvin refused to leave Glasgow, remaining Professor of Natural Philosophy for over 50 years, until his eventual retirement from that post. The Hunterian Museum at the University of Glasgow has a permanent exhibition on the work of Lord Kelvin including many of his original papers, instruments and other artifacts such as his smoking pipe. Always active in industrial research and development, he was recruited around 1899 by George Eastman to serve as vice-chairman of the board of the British company Kodak Limited, affiliated with Eastman Kodak.